An international political consulting firm specializing in the use of grassroots tools for advocacy, innovative campaign approaches and leadership development. Host and Producer of Fatima’s Hand Podcast – featuring change agents across the globe fighting for equality. Combining politics with everyday activism, hear inspiring stories and practical advice from women in the Middle East, Africa and Europe. Clients include NGOs, international development organizations, elected officials,candidates, women's organizations, thinkers, doers, and anyone who wants change. 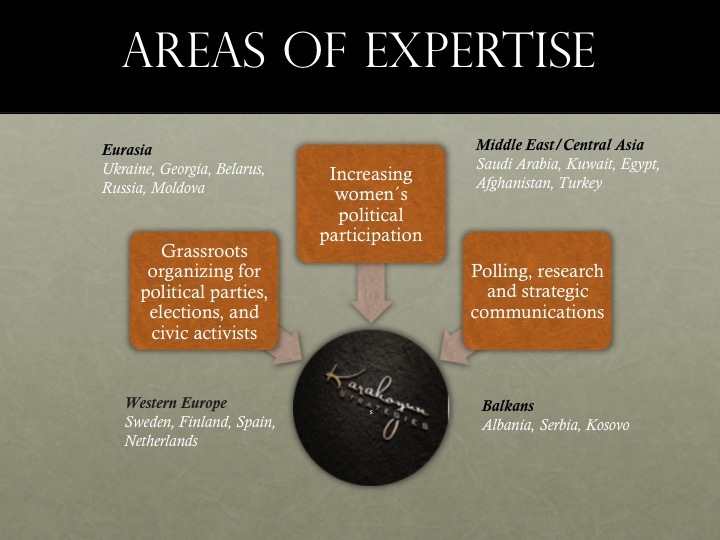 Read more about Karakoyun Strategies Founder, and the team, and learn ways that we can assist you in grassroots organizing, elections campaigns,strategic communication, referendum, women's participation and program evaluation. Articles (including rants and wishes) and on the topic of women´s political participation with toolkits for action can be accessed here. Read more about what Karakoyun Strategies means, and stands for.